A Modern Science Dilemma: Is It Ethical to Edit the Genes of Unborn Babies? 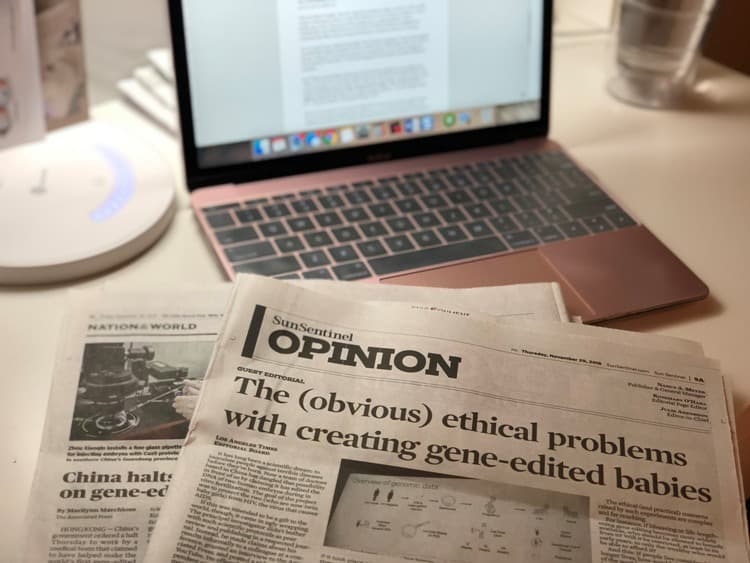 Canada Pharmacy Online > Blog > A Modern Science Dilemma: Is It Ethical to Edit the Genes of Unborn Babies? As science progresses and research takes us further and further into an uncharted future, ethics and morality will continue to be a hot topic as they relate to scientific advancement. Just because we can do something, does it always mean that we should? As scientists figure out more and more advanced procedures, every now and then a controversial practice arises that forces the scientific community and the world at large to step back and take a look at the implications and potential consequences of pushing our research as far as we can possibly take it as a human race. Recent headlines seem as if they are coming out of a dystopian world of the future, the kind of unrealistic place we’d watch in a sci-fi film, not a real world scenario. However, believe it or not, we are here and these are real headlines. What are the ethical implications of creating gene edited babies? Is this technology appropriate and helpful or is it leading us quickly to the precipice of the downfall of the human race? Join us as we take a close look at the recent news out of China and consider what it means if one researcher’s purported experiment proves to be true. If scientists are able to edit the genes of babies to make them immune to diseases, what does that say about the future of illness, science, disease, and medicines? How will such an ability change the face of health care and prescriptions as we know it? After all, if we can alter a person’s genetic code to create immunity to disease, what is the use of the medical field or medicines? There would be no need for prescription drugs if we can alter a person’s health from the level of their genetic makeup. Ready to learn about one scientist’s claims regarding his successful research on gene editing and what it means for the world? Keep reading. “It has long been a scientific dream: to inoculate people against terrible diseases before they’re born. Now a team of doctors based in China has dangled that possibility in front of us by claiming it has edited the DNA of two human embryos during in vitro fertilization. The goal of the project was to protect the two (who are now twin baby girls) from HIV, the virus that causes AIDS. The news broke when Chinese researcher He Jiankui presented at a conference on gene editing in Hong Kong. During his presentation, he laid forth his claim that he had successfully created the world’s first gene-edited babies using CRISPR technology. CRISPR is a tool that enables scientists to control the genes of an organism by eradicating anything undesirable and possibly adding what is appealing. As of yet, there is no independent research available to corroborate He’s claims. However, he did issue a statement after departing the conference early and said that he would cooperate fully with the inquiries into his work and would make his raw data available for review by third parties. So, even though He has undertaken some seriously questionable scientific research with CRISPR, most of the scientific community is not on board with him or the way he decided to carry out his unpermitted experiments. Rewriting the code of life in an effort to correct dysfunction or prevent diseases seems noble but it’s essential that such a sensitive effort is undertaken properly. What are the ethical implications of editing the genetic structure of humans? Of course, gene editing had already been taking place even before He’s recent news-making activities. But so far, it has been reserved only for non-viable embryos that have a next to impossible chance of being born healthy or without some sort of horrible illness or debilitating condition. Still, even that research is extremely controversial. People are unclear on whether such testing is ethical and moral. The concerns that stem from experiments like these are extremely complex, and it’s likely that we’re only beginning to understand just how far reaching the implications may be. For example, if scientists find a way to extend a person’s life expectancy, who will this technology be made available to? Likely only the rich who can afford it, at least when the technology is first released. Who will be allowed to benefit from gene editing? What kind of side effects will it have that we have no way to predict yet? While the ability to simply “turn off” a gene that predisposes people to cancer or other horrible diseases sounds great in theory, it seems that humans are not yet advanced enough to be able to handle such a power. There has not been enough time for experimentation or ethical considerations, and scientists do not yet have proof of what the long term consequences or unintended side effects may be. Playing God has never worked out well for us in the past. Thus, as we can already see, the power of being able to edit or alter a person’s genetic structure using CRISPR may have unintended consequences that could actually prove to be worse than the possibility of the condition the researchers were trying to tackle in the first place. Not to mention the questions of overpopulation or caring for aging populations as people live longer and longer lives. If the world is already overcrowded and unable to support the population size that only continues to grow, what would happen if those 8+ billion people begin living even longer than they already do? Genetic privacy: what is it and why is it important? One news source, Live Science, points out another important consideration for the gene editing scenario. The babies born of genetic testing and experimentation -- including the set of twin baby girls that He claims to have already brought to full term -- will never have a chance at genetic privacy. Bioethicists realize that people are going to want to see, study, and learn about the children who result from such futuristic experiments. Recent news with DNA testing and its ability to aid law enforcement in solving crimes -- even long forgotten cold cases -- has brought this concept of genetic privacy to light, and the gene edited babies situation only calls it into question all the more. Our genetic code is linked to us irrevocably. By providing open access to our DNA, we lose all semblance of privacy or anonymity because our genetic code is unrepeatable and completely unique to us. There is no way we can be confused with anyone else when we’re talking about our unique DNA strands. With such experiments on hand, the argument could be made that the data and research belongs to the people of the world. But what about the individuals who are made up of the DNA in question? Do they have no rights themselves to opt out of the research-fueled life they never agreed to? This sensitive information reflects the most personal of things. While research on their genes could move the human race forward, the ethical implications are essential to consider if we are to have any hope of going about this research the correct way. Using the DNA of adults who have agreed to be subjected to testing is one thing. But acting on unborn embryos who cannot yet vie for themselves? That is a questionable practice, to put it lightly. However, as He has reported that the second relevant pregnancy is already underway, it’s a question we need answers to as quickly as possible. The pregnancy is still in its early stages and not yet guaranteed to last, but the implications remain the same. While the practice of editing the genes of unborn babies, whether through CRISPR or otherwise, remains controversial and hotly debated, it’s important to remember that not too long ago, the practice of in vitro fertilization -- the very process involved in the gene editing technique, which is now widely practiced and commonplace, especially for those who are having trouble conceiving naturally -- was also criticized. Its opponents viewed it as an unethical tampering with the hand of God, a way to step in and disrupt the normal course of human destiny. We may see the technology to cure diseases and improve life for humanity as a whole as we go on, but as the editorial board of the Los Angeles Times points out, “It’s important to ensure that scientific advances aren’t getting too far ahead of our understanding of how to use them.” Either that, or we need to evolve our understanding all the more quickly in order to keep up with the fast pace of scientific research and advancement. So while our current understanding of gene editing does place it further toward the “unethical” end of the spectrum, it’s important to remember that this perspective may shift over time as scientists uncover more with their research and better understand the ethical and moral implications of being able to customize the human genomic structure. As the future marches on and humanity pursues progress and innovation, there’s really no telling what changes we may see that currently lie beyond our wildest imaginations. Keep your eyes open, your mind sharp, your heart soft, and enjoy the ride.